On September 17th I attended the CollegeBoard‘s 2015 Counselor Workshop at the University of Richmond. I was eager to go for several reasons; partly because I’d never been to one before (my last school was located a bit off the beaten path), partly because the University of Richmond has one of the most beautiful college campuses I’ve ever seen, and mainly because the program promised to go in depth about the changes to the SAT, which is highly relevant to my new job with Method Test Prep. I thought the session was very interesting, and many of the attendees seemed to find it to be quite informative. I don’t think I’d go that far, and to me what wasn’t said resonated more than what was said. The workshop took place from 9am until noon in a large flexible space at the University’s student center. There were about 140 chairs and all of them were full, with some people standing at the back; based on what I could figure out, the audience was guidance counselors from local schools from the surrounding counties. I tip my hat to the CollegeBoard for making sure that there would be plenty of chances to go to a workshop–there were nine in Virginia, taking place all over the Commonwealth, and a similar number in other states. All of the attendees received a nice totebag filled with College Board posters, notepads, presentations and a flash drive with digital versions of almost all of the files included. Well done, CollegeBoard! The meeting began with U of R Dean of Admission Gil Villanueva welcoming us to campus (the event was staffed by admissions office people and there was a chance for tours after it was over), telling us that he thought it was time to reconfigure the SAT, and that he thinks the new test will be a good one. He also noted that when he polled members of the Southern Consortium of Colleges, there was no consensus on how schools would use the new writing section of the SAT. Considering that after a decade of the current writing section, there are still a great number of colleges that ignore it, this doesn’t bode well for students. They might be tempted to avoid the optional essay (it’s 50 minutes long), but then find out that one of their schools requires it. I expect that this will be an area of confusion for students and counselors for years to come. While the PowerPoint presentation contained information about all of the CollegeBoard’s products, services and efforts (including Advanced Placement, Fee Waivers, the “4 or More” movement, and the CSS PROFILE), the focus of the morning was the new SAT and the new PSAT. 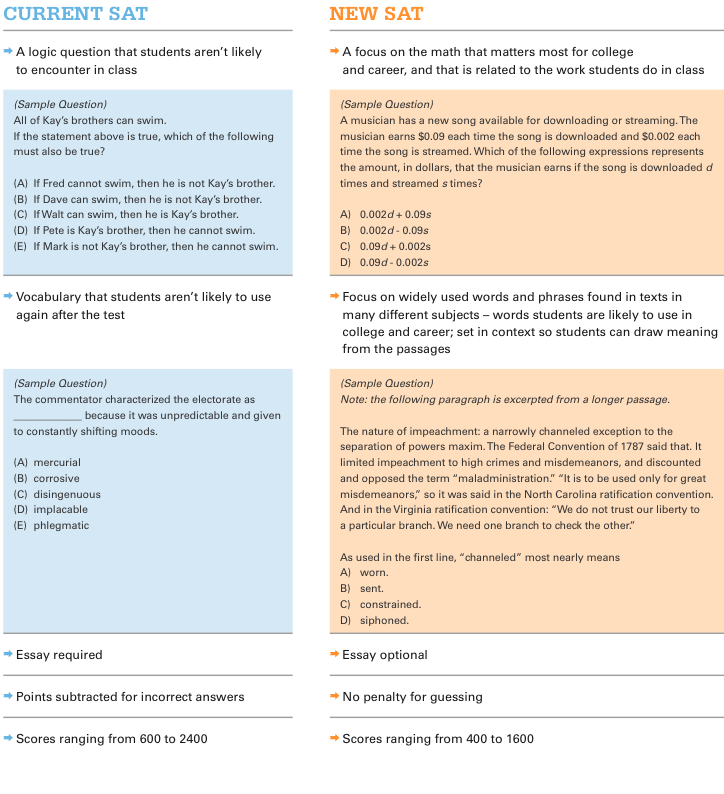 The current SAT that we know and love (loathe?) will be administered four more times (October, November, December and January), so students in the class of 2016 will not need to worry about the redesigned test. 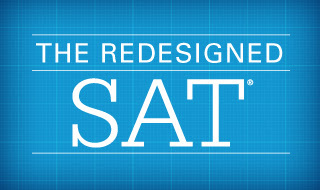 But starting in March, the test will be reconfigured and scores recalculated, which means all other high school students need to be aware of what they will face; and in a cruel twist, the PSAT, which is administered in October to 11th graders to find National Merit Scholarship candidates will be modeled after the NEW test, not the current one. While this makes sense (it would not be useful practice for Juniors to take a PSAT that doesn’t look like the SAT they will face), it is tough, because there has not been much time for students to prepare for the new exam–I expect scores will be much lower than on previous years’ PSATs. The speaker started by discussing the “SAT College and Career Readiness Benchmark”, which is a score 1550 out of 2400 possible points (just slightly above the national average). I’ve written about this previously, and at that time I concluded that income inequality and lack of access to test prep and Advanced Placement made the CollegeBoard’s analysis suspect. Three years later, the numbers are still stark: only 41.9% of SAT takers met the benchmark, but as bad as that sounds, only 16.1% of African-Americans met the goal, and only 22.7% of Hispanic Americans achieved the benchmark. This would be extremely alarming if the test actually measured “college readiness” (whatever that is), but even in the real world, it is worrisome. My colleague, Evan Wessler, has analyzed the scoring scales for the new test and he has observed that the CollegeBoard has made the test harder in the math section (including the new “no calculator math” section, or as we called it back in the 1980’s “math”) and will adjust the scoring so that students will only need, for example, 41% correct answers to earn a 500, as opposed to the current 57%. The math section will cover “the math that matters most”: algebra, ratios, proportions and statistics. Only 10% of the test is geometry and trigonometry. In other words, I was right back in 1985 when I told Mrs. Hoffman that geometry didn’t matter! The vocabulary question in the lower left is very easy to answer: just ignore everything before the blank, and choose which of 5 words can be defined as “unpredictable and given to constantly shifting moods”. The CollegeBoard claims that the words on this list are simply “SAT words”, and will not be useful to the average person. I don’t want to engage in that argument, but take a look at the words in the new question shown at lower right. Students will see multiple questions based on a passage with 6-8 paragraphs like this one. I can see kids getting lost and confused, and maybe just giving up and guessing, which doesn’t help assess readiness of any kind at all. I was disappointed that the presenter never mentioned the relative difficulty of the new test. It is far too early to tell just what colleges will even do with the new test data. Unfortunately, for reasons that I can only conclude are unwholesome, some colleges have already declared that applicants from the class of 2017 will be obligated to send new SAT scores, discouraging them from getting a head start and trying to get good scores on the outgoing test. The presenter told us that Virginia Tech would be among those schools , and a member of the audience said that she had heard that James Madison University and the University of Virginia would require it as well. My limited experience with UVA makes me doubt that they will be very explicit about this, because I can’t imagine that they will want to risk what look like lower scores among their freshman class of 2021. After this post went live I heard from UVA, who confirmed that class of 2017 applicants will NOT be required to take the new test. 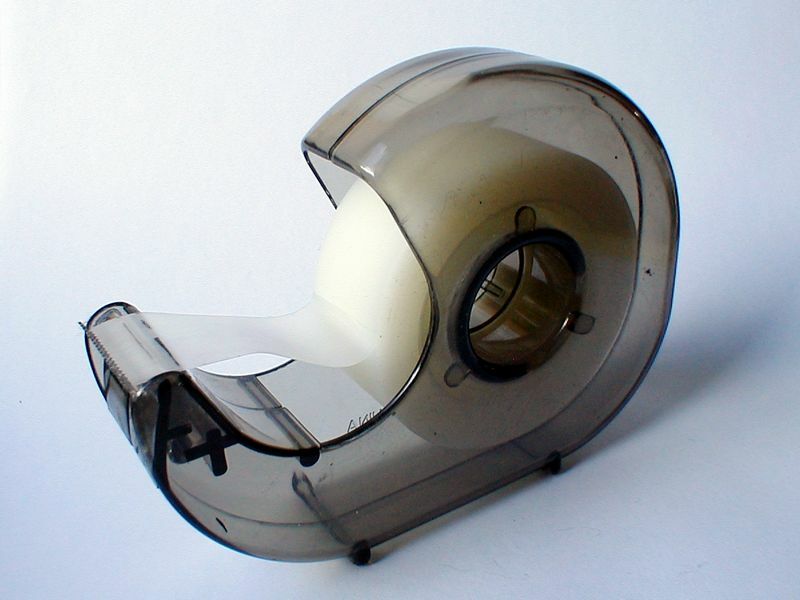 The CollegeBoard is fully committed to “transparency” and as a result, they promise that students will receive highly detailed information about which aspects of the test they did best on, and what they specifically need to improve. As of September, however, the boffins in the lab had yet to create a mockup of an actual score report, so it is vaporware at this date. Another way they expect to increase transparency is that the PSAT will be a slightly simplified version of the new test. 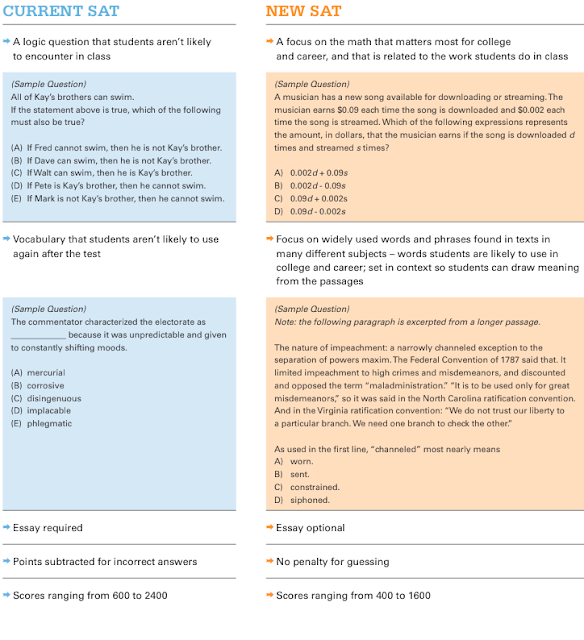 Instead of a scoring scale up to 240, the new test will be scored on a 1600 point scale just like the new SAT (actually, a 1520 scale because it will omit the hard questions). Unfortunately, this transparency will extend to the material sent to colleges: every college that gets student score reports will see the detailed subscores showing all of a student’s strengths and weaknesses. This is less troubling to me than it sounds on the surface (because I doubt that colleges will actually want to spend time looking that deeply), but it is clear that the score reports for the new test will be quite different from what colleges are used to seeing. Supposedly the College Board will have a concordance between the current test and the new test by June. Then a concordance to the concordance will be created to equate new SAT scores to the ACT. Oh right! The ACT. Maybe I shouldn’t have been surprised, but the CollegeBoard presentation did not mention the OTHER standardized test that colleges consider when making their admissions decisions (unless they are on the FairTest.org list of test optional schools, or unless they are my alma mater, Hampshire College, which doesn’t allow applicants to submit test scores, and they are doing just fine, thank you). That said, widespread murmurings among the counselors indicated that more than a few will be advising students to prepare for the ACT, and to avoid risking the confusion attendant with a brand new test. One person asked if her students would be “guinea pigs”, which elicited an emphatic negative from the presenter. But how else can you characterize the students taking the PSAT and the new SAT in March (and maybe in May)? At the risk of burying the lede, one very positive change that the CollegeBoard wanted to announce was their partnership with Khan Academy to provide “personalized”, “official” test prep for free. In the interest of full disclosure I have to acknowledge that I am a part of the test prep industry, but I think that the association with Khan is a great step. The Khan Academy SAT resource has been available for a few months, and according to the presenter it will continue to evolve. My colleagues and I have all used it, and it is nice; it’s similar in some ways to what companies like Method Test Prep offer, but lacking in other areas. The presenter told us multiple times that she “can’t wait to show” us Khan’s features, but bewilderingly, she never did. The one feature she did tout was the “personalization”, whereby students can choose to share their scores with Khan Academy and using their past performance, the program will suggest lessons and practice questions for them. It sounds nice, but I wonder how it will work in practice. The idea of students “opting in” to sharing their information was a bit of a contentious one for some of the counselors at the meeting. The presenter was adamant and emphatic that the CollegeBoard never sells student information to commercial entities; unfortunately, she completely ignored the fact that they made a great deal of money from selling student information to non-profit colleges and universities, not to mention the profit they make from the CSS PROFILE, AP tests and states that pay for every student to take the SAT. Years of experience has shown that the students who get the most from test prep are the ones who put the most into test prep. No matter how personalized, students will still need to be motivated and committed to put in the time. I think it is laudatory that the College Board, Khan and the Boys and Girls Clubs are all trying to reach lower income and first generation college students, but it is still in the service of administering a test that does not predict college success, and that helps maintain the privilege of wealthier, whiter young people. Needless to say, this was not a viewpoint that was expressed during the workshop. The workshop concluded with a presentation by Cynthia Deffenbaugh, the University of Richmond’s Vice President of Financial Aid. She gave a very useful talk on “myths” about financial aid. The overriding point is that financial aid exists, that students don’t have to become victims to college debt, and that financial aid officers want to help families pay for their children’s educations. These were excellent points! I will say that as a college student in the late 1980s my friends and I thought that the financial aid office was our adversary. This was patently false (and stupid on my part,) considering that the only reason I could go to what was then the most expensive college in America was very generous aid. In my career as a college counselor I have come away convinced that financial aid officers take seriously the mission to help students, and I encourage families to try to build good relationships with the aid office. In conclusion, I am very glad to have attended the College Counselor Workshop. I commend the College Board for making an effort to make sure that important information is disseminated as widely as possible. There were many points in the presentation where it was evident that information that had been published on the web for months came as a total surprise to large groups of the counselors in attendance, so just for that reason, the session was valuable. I also commend them for trying to make their test more relevant. I think the thing that troubled me the most was the way that the presentation treated CollegeBoard products and services as indispensable tools for college counselors to employ while helping their students. Leaving aside for a minute the way that the ACT was completely ignored, I think it is wrong for the CollegeBoard to present themselves as partners with college counselors. I now work for a for-profit company, and I present myself as a former college counselor who is concerned with the college admissions process. I love to have a chance to help my former colleagues help their students have access to high quality test prep resources, but I am not really in the college counseling business anymore. I found the packets that we received explaining the college process (and putting College Board products front and center) to be commercial at best and sneaky at worst. 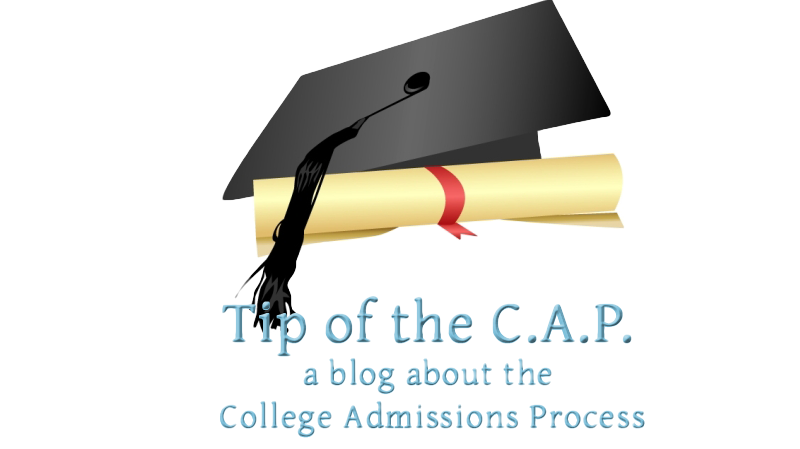 Students can go to the college of their dreams without ever sitting through an SAT, taking an AP class, or sending a dollar (or a fee waiver form) to the CollegeBoard, and that’s the way it should be. Have you been to a College Board workshop? Are you concerned about the new SAT? Please share your experiences or thoughts in the comments section below. "Unfortunately, for reasons that I can only conclude are unwholesome, some colleges have already declared that applicants from the class of 2017 will be obligated to send new SAT scores, discouraging them from getting a head start and trying to get good scores on the outgoing test." "Note: Those who plan to apply to Virginia Tech for the fall of 2017 and beyond, are required to take either the ACT or the redesigned SAT test, which will be available on March 6, 2016." I think it's only reasonable that universities do not want a current sophomore to take a test two years before he/she applies to college, but perhaps they need to make this requirement even more clear or transparent to avoid confusion. This past week I attended the College Board presentation in my home state of CA, as well as the University of California (UC) and the California State University (CSU) Counselor Conferences. Both the UC and CSU made it very clear that this year's juniors, class of 2017, are welcome to submit whichever test they choose. Perhaps it's different in the east, but I think most of the western schools my students favor know that next year's applicants (class of 2017) are in the hot seat for testing this year and are flexible to either test, so that is how I've been advising my students. Good points, Gina. While the CB presenter said class of 2017 applicants "must" take the new SAT for Virginia Tech, the link I included merely says "should". I agree with you that it only makes sense for colleges to be as ecumenical as possible regarding standardized tests for the class of 2017. Thanks for reading the blog!